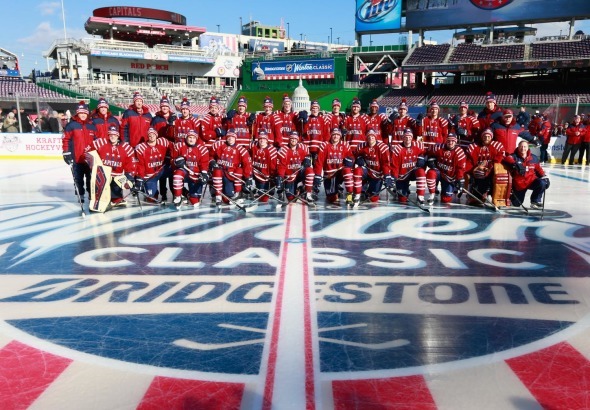 The Washington Capitals have won the Winter Classic. Now What? To be honest, this hockey season has been a weird one to watch as a Caps fan. At first, the boys in Red looked solid at 4-1-2, including having the best score-adjusted puck possession in the Eastern Conference at 56.3%. Then November came, and the Caps fell to 10-9-4 and that possession shriveled to a mediocre 50.6%. It’s one thing if they were playing Chicago or Los Angeles all month, but Washington was playing New Jersey, Buffalo, Arizona twice, Columbus, Toronto, Colorado and Calgary instead. Even when the Caps rebounded to 17-10-6 by December 22nd, their possession only improved to 51.6% during that stretch and their strength of schedule seemed to be the worst in hockey. Again, their is no indication whether strength of schedule should be a huge factor in the NHL, but it just seemed like the Caps weren’t beating teams like they should be when they had the chance, even if the new system implemented by Barry Trotz was going to take some time. Even in hockey, what comes down must always come up and vice versa, and that meant the Caps were surely going to play tougher opponents. After losing to the Rangers, Washington probably had their best game of the season, eye test-wise, against a depleted Pittsburgh team, but then soon fell to the New York Islanders in overtime after starting 3-0 down. How on earth was I supposed to feel watching this year’s Winter Classic, against the best team in hockey in the Chicago Blackhawks and knowing that road teams have won four of the first five of these games. And then, the Caps not only won, but they won the possession battle and gave D.C. a small amount of civic pride after countless embarrassments by Daniel Snyder’s idiots and 21 years of sleepless nights after countless shocking playoff losses. As much as winning another Winter Classic was so awesome, a reminder has to be made that there are another 45 games to go. The Capitals are hitting the tail end of a three week stretch in which they are playing some of the better teams in the league. From December 22nd to January 10th, they have been playing or will play seven teams that are in playoff contention and five of the top eight teams in the NHL. Immediately after the All-Star break and into February 21st, they will play 11 playoff teams in 14 games, including Pittsburgh, Los Angeles and Anaheim twice. Lastly, the Eastern Conference is just better as a whole. Coming into today’s games, the Eastern Conference has only lost 97 of the 204 match-ups against the Western Conference and the cutoff for a playoff spot is looking like it would hit Florida’s pace of 98 points. Sitting behind that is Toronto at 92, followed by Boston at 90. Even if the Bruins get healthier, this is the worst offensive team they have had in six years from an unblocked shot attempts standpoint. While Toronto is once again banking on not having their poor puck possession come to haunt them and even if their offense is better than last year, their defense will be giving up shots at a bottom-five level for the third straight year and below league average for the fifth straight year. At a 100-point pace and under the other team’s parameters, Washington should be comfortable for a playoff spot, but they will also be expected to play either the New York Islanders or Pittsburgh Penguins in the first round. If they want to go beyond just having another good season, Trotz’s men will have to continue to play well against better teams and they will have to do so under the following guidelines. First, they have to ease off Braden Holtby’s workload. So far, he has played in 32 out of 37 games and started 29 of them; which would put him on pace for close to 71 games. Since the 2005 lockout, there have been 15 goaltenders that have gone on to play 70 games or more. Of the five that have pulled it off multiple times during that span, four of them were the best of their generation and Evgeni Nabokov wore down considering that he played that much at age 32 and 34 respectively. Of all the goaltenders that only played 70 games once since the 2005-2006 season, only Ryan Miller’s season seems justifiable in the long term and while Pekka Rinne may join him in this category, remember that he was injury riddled last season and Nashville suffered immensely because of that. Jonas Hiller, Nicklas Backstrom and Craig Anderson became very inconsistent goaltenders throughout the rest of their careers. Andrew Raycroft is…well…Andrew Raycroft. Like Nabokov, Marty Turco was too old when he played more than 70 games and Cam Ward picked up too many injuries to count. Caps fans better hope Holtby falls under that last category with Jonathan Quick and Carey Price: goaltenders that received a massive workload at a time when they are still developing but are now coming out as some of the better goaltenders in the league. Somewhere along the line, Trotz has to put in a struggling Justin Peters or consider waiving him and play Philipp Grubauer instead. Even if you say that Holtby has the youthfulness (sans beard) and talent to play over 70 games, that might end up being a false statement. So far Holtby is having a very good season after such a poor start. His quality start sits fifth among qualifying goaltenders at 65.5% and his point shares per 60 minutes via hockey-reference.com is ninth at 0.198. That’s not to say that point shares per 60 minutes is not a flawed stat, but the law of 0.185 indicates that Holtby still has a ways to go before we officially call him a “guaranteed” elite goaltender in the NHL. However, based off of playing with numbers since working on this blog, goaltenders seem to find a way to breakout at age 25, peak at age 28 or 29 and then plummet once they hit 300 or more NHL games. Holtby has been able to lift off as a starting NHL goaltender when he hit his age-23 season, but where he “peaks” will be critical to Washington’s success long term and the last thing that should happen is for Holtby to plateau from here on out because of an exhausted workload. The second thing that has to happen, and this will be critical to the success of the Barry Trotz era, is to figure out what to do with Washington’s four young forwards that are under their rookie contracts. At this point in time, let’s look at those four youngsters and where they stand in terms of point shares this season. It’s pretty clear Latta is nothing more than a bottom six center right now, despite being a very effective one and a savior in the Martin Erat debacle of a trade. For Wilson, his numbers compare to that of Brooks Laich, except with zero role on any of the special teams units. So far, he is on pace for only 4 goals and 19 points and even if he is two years younger than when Laich was entering his second year, he should be producing more if he will ever be a consistent top six forward and stop attempting to shatter the mark for penalty minutes for all second-year forwards in penalty minutes during the Ovechkin era. Lastly, let’s talk about two skilled wingers that turned into centers this season. It is shocking how eerily similar Evgeny Kuznetsov’s numbers are right now with Mathieu Perreault’s entire 2011 season. Both have played 35 games and 416 minutes and had 14 points and 1.5 point shares. Meanwhile, nobody knows when Andre Burakovsky is coming back into the Washington Capitals lineup. After an ugly episode of being controversially not released to the Swedish National Team for the World Junior Championships, the former 2013 first round pick still hasn’t played that much since the beginning of December and who knows how long he may ever come back into the lineup. No matter how you look at it, Burakovsky is looking like another of a list of rookies that have been thrown into the fire too soon by Capitals upper management since last season, even if there is a new General Manager and head coach in place. Since his Nashville days, Trotz has only had one Under-20 player play for the Predators and play more games than Burakovsky in one season: Scott Hartnell. In 2001, an 18-year old Hartnell would only score 2 goals and 16 points and collect 0.4 point shares in 75 games. Since then, however, Hartnell has played more games than anyone in the 2001 draft class with 983 and has racked 556 points and 63.2 point shares (5.27 point shares per 82-games). If you add 20-year old rookies to the equation, Colin Wilson, Martin Erat and Alexander Radulov spring to mind. Caps fans should know what happened to Erat and all hockey fans should know what happened to Radulov, but both players showed enough raw talent from the get-go and the same is being shown for Burakovsky. Wilson seems to be a perfect comparison for him considering the lack of playing time, yet solid production. Wilson has gone on to become a solid top-six forward that has been unleashed by Laviolette’s army. That said, Wilson was more of a 40-50 point player under Trotz and Burakovsky has been given better zone starts than Wilson ever dreamed of his rookie year. In short, the realization is that Trotz doesn’t differ than any head coach when it comes to developing his players (eight under-21 forward rookies in sixteen years versus five in nine for Washington). It will be interesting to see if Caps fans can except that. That being said, the second line of Marcus Johansson, Troy Brouwer and insert center here has always seemed to be a bit too shaky to everyone’s liking and Washington can not afford for this line to go cold again – and again – and again. Since opening day when Liam O’Brien made the team, there was always a feeling like this team had too many bottom six forwards and not enough skill guys. Under Trotz, who knows if the Caps will be pushing too hard to acquire a forward that goes for goal but may not be suited to his structured game plan. Antoine Vermette has been rumored to be somebody that has been under Brian McLellan’s radar, but his career numbers show that he has been more of a detriment than a key player when on the ice. Even though he has had plenty of playing time on Arizona’s penalty kill, it seems like you’re not missing much in losing out on him unless you want cover for Brooks Laich. It can’t be stated enough how much this year’s free agent class at forward is terrible and considering how tight the Caps are in the Salary Cap (puns!!! ), they will have to give up more in order to bring in a top six forward that will make this team better, guaranteed. So with that, let’s pray the kids get better, otherwise it might be another first round playoff loss to a team this fan base has seen beaten us before. Let’s hope I am an idiot!